Las Vegas is awash with brightly-lit hotels as far as the eye can see, and the plethora of places available can present something of a dilemma when choosing where to hang your hat. Over 35 million people visit Las Vegas every year, staying in one of the city’s 130,000 hotel rooms. 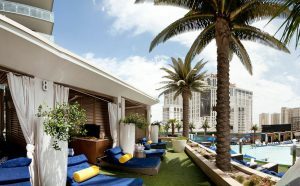 Whatever the reason for your visit the perfect accommodation awaits, as Las Vegas has something just for you, from some of the most luxurious accommodation establishments in the world to plenty of rooms that are a little easier on the pocket. Downtown Las Vegas is a great place to stay. Revived with the Fremont Street Experience, the old places are still here, but are bigger and better than ever. The perennial favorite and world famous, the Golden Nugget, has an updated look, but retains the same great service and amenities. The Four Queens is also a popular choice. Binion’s still has the nostalgic feel of the old days, both in the casino and in the rooms. The El Cortez, built in 1941, still looks the same, but with an additional 200-room tower. The Plaza Hotel is better than ever, offering fine dining at the Center Stage Restaurant, overlooking the neon extravaganza of Fremont Street. The Bellagio remains the epitome of luxury, with Tuscan architecture, gourmet restaurants and upscale shopping. Las Vegas rarely gets the credit it deserves as a city that has attractions other than its vices; as a city of more than one million inhabitants, it seems to be only known through its party-loving reputation. For sure, the casinos and nightlife are what bring visitors here, but there really is life away from the slot machines and showrooms. Las Vegas is now marketed as a family destination, and there is no shortage of innocuous and interesting attractions. There are hundreds of great hotels to choose from in the heart of Las Vegas, each with something special to offer to tempt visitors.